Afternoon Glow along Wall Street in Zion National Park. 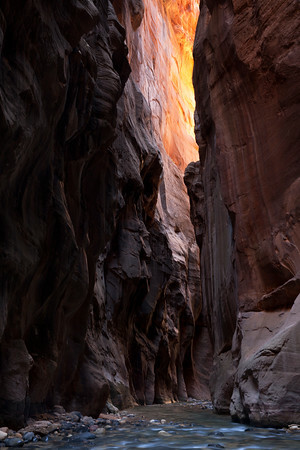 The Zion Narrows is considered one of the world's best canyon hikes. For a photographer there is a lot to work with, but you cannot sit still. The light is constantly changing and the challenge is to know where to be at certain times to catch the best conditions for a dramatic image. To capture these fleeting moments... your on the move, chasing the light throughout the narrow canyon.